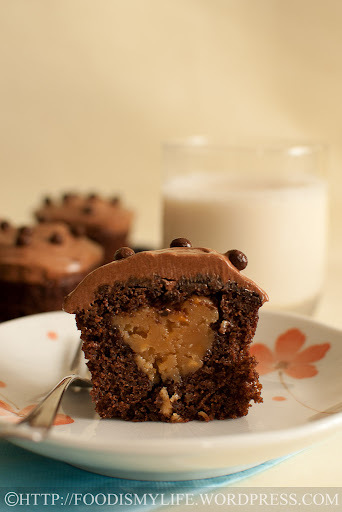 I just found out that I’ve not blogged about these sinful, delicious and rich cupcakes! I’ve shuffled some of my posts in order to fit into some of the baking events schedule and these cupcakes were unfortunately forgotten – and I really should have post them out much earlier, because they were really yummy! 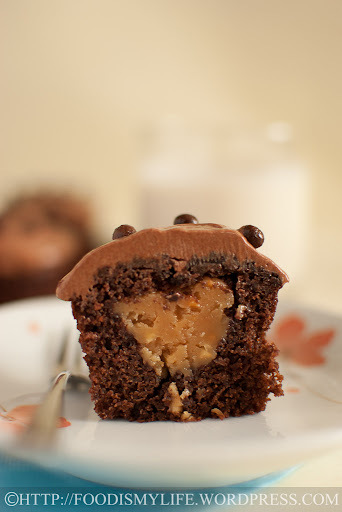 This cupcake has a sweet and chocolatey Varlhona chocolate cake base with a salty, creamy and peanuty peanut butter filling, topped with a bitter-sweet, sinful and luscious chocolate ganache. I hope I’ve got you drooling! It is a very rich cupcake – you’ll only need to eat one or two at a time. It’s also not very hard to make, the cupcakes are made using the Everyday Chocolate Cake recipe, which is very easy-peasy! The filling is simple – just dump all the ingredients and whip it altogether. 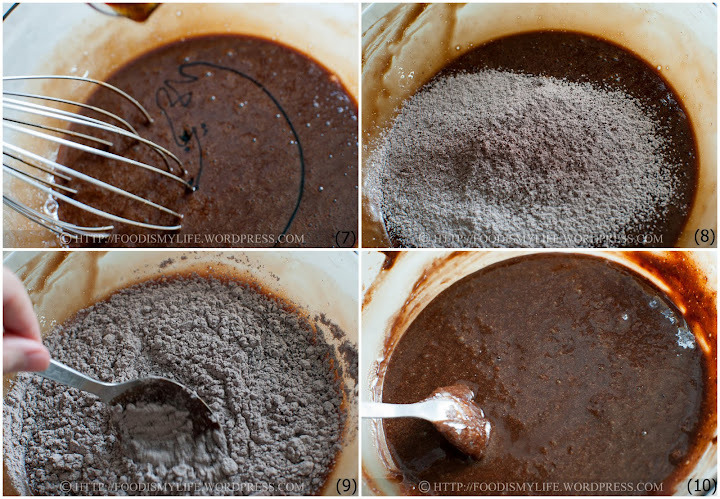 The ganache – simply pour the hot cream over the chocolate, let it melt, cool theh whip it until light. It may seemed a bit tedious to assemble all of these together, but the results are worth every single bite! 10) The final cake batter! And bake away! It may look a bit ugly, but don’t worry, the ganache will cover it all up! 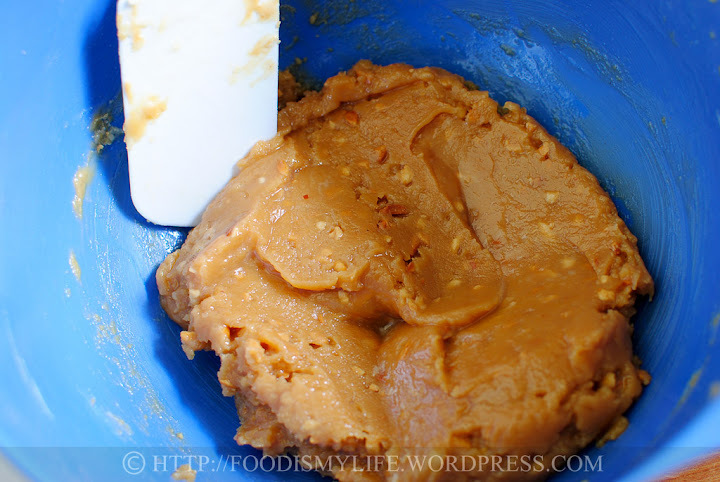 Mix all the peanut butter filling ingredients together. Delicious, rich, sinful, chocolatey and sweet with a slight hint of bitter (ganache) and salt (peanut butter)! Ok, enough of this depressing stuff. :p On to the full recipe! Preheat the oven to 175 degrees Celsius. Prepare 18 - 20 cupcake liners. Once the chocolate and butter has melted, remove the heatproof bowl from the pot. Add in the caster sugar and whisk gently - not all of the sugar will dissolve, it's ok if the mixture is grainy. Let the mixture stand for 10 minutes to cool down slightly (the eggs will scramble if added into a hot mixture). 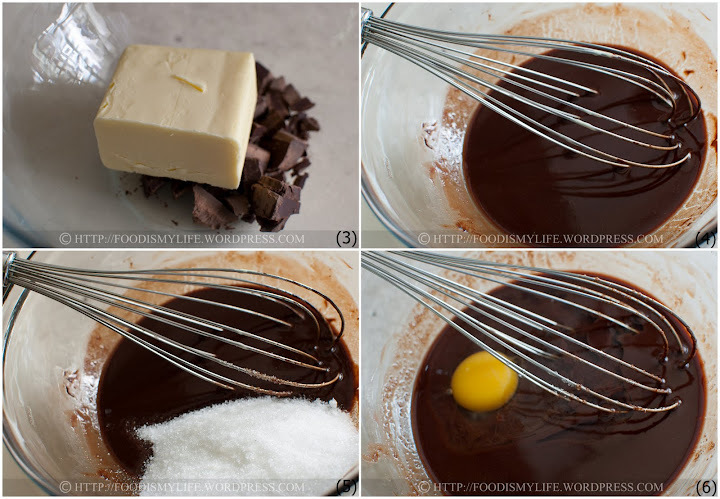 Crack in one egg into the chocolate mixture. Whisk the mixture with a wire whisk for 30 seconds until it is fully incorporated. Whisk in the second egg, and then whisk in the vanilla extract. Scoop the cake batter into the cupcake liners. Do not fill it more than ⅔-full, otherwise it will overflow during baking. Bake for 20 to 25 minutes until the top bounces back when touched lightly and a skewer inserted into the centre of the cake comes out clean. Cool the cakes completely on a wire rack. Place the cream cheese, peanut butter, icing sugar and vanilla in a medium bowl. Beat the mixture using an electric mixer until the sugar has dissolved and the frosting is light and fluffy. Add in a little bit of milk to thin the consistency (makes it easier to scoop). Stir in the chopped peanuts if using. 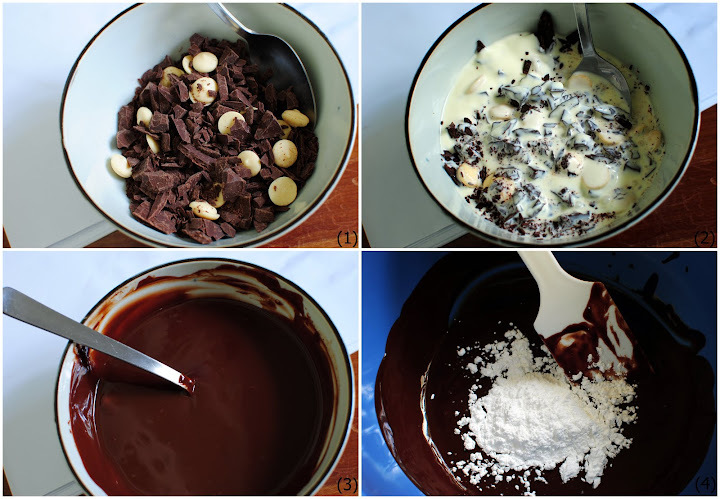 Stove method: Place the chopped chocolate in a heat-proof bowl. Place the heavy cream in a small pot and heat over medium heat until the heavy cream comes to a simmer (small bubbles appear on the sides of the pot). Pour the hot cream onto the chocolate and let it stand for 1 minute. Stir the mixture until all the chocolate has melted and the mixture is smooth. Add in the vanilla and butter and stir until all the butter has melted. Let the mixture cool to room temperature. Microwave method: Place the heavy cream in a microwave-safe bowl (glass or ceramic). Microwave the cream on medium for 30 seconds until the cream is hot. 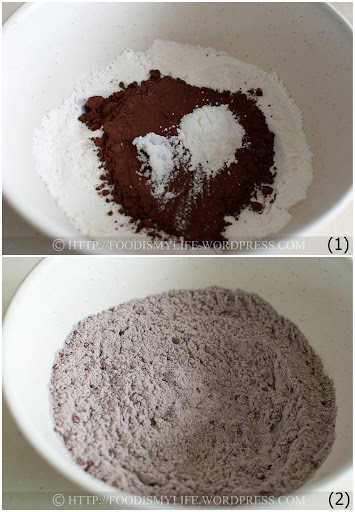 Add in the chopped chocolate and stir – the chocolate will start to melt. Place the bowl back into the microwave and microwave for 10 seconds. Stir the mixture and if there’s any remaining un-melted chocolate, repeat the process (do not microwave for too long at one go unless you want to burn your ganache). Once all the chocolate has melted, add in the vanilla and butter and let the mixture cool to room temperature. 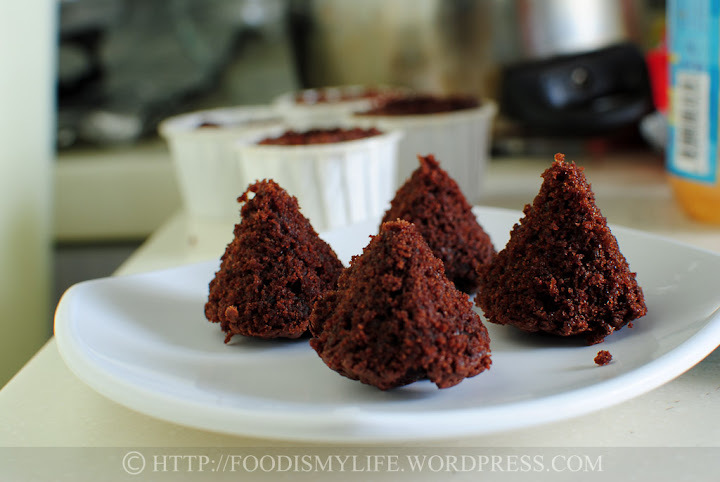 Using a small knife (I used my plain old butter knife that has jagged edges), cut out a cone in the cupcake. The trick is to insert the knife about ¾ into the cupcake - not straight down, but at an angle towards the centre of the cupcake. Hold the knife in place and turn the cupcake, so that you will cut out a cone. Scoop about a teaspoon (depending on your preference, but I prefer to scoop in slightly under a teaspoon) of the peanut butter filling into the middle of the cupcakes. 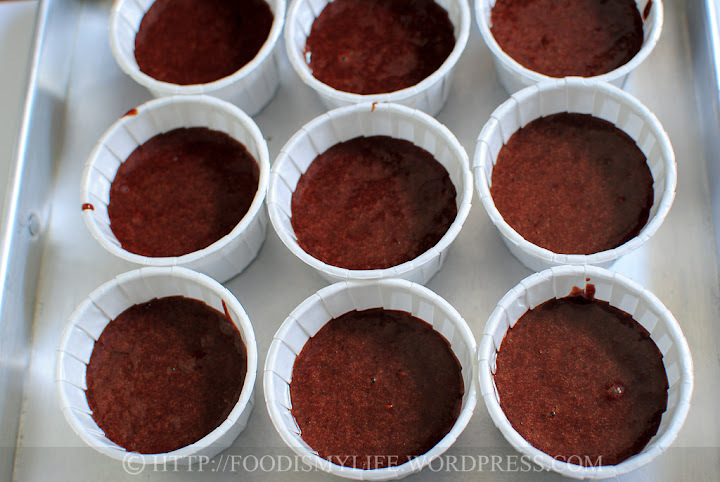 Replace the chocolate cake disks and press it down gently. 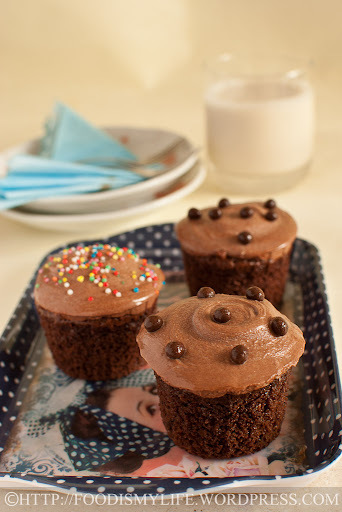 Spread a thick layer of chocolate ganache over the top of the cupcakes and decorate as you like. 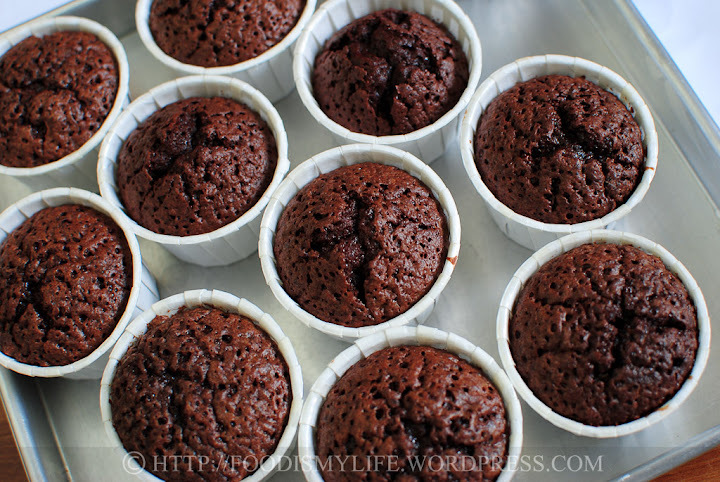 Storage: These cupcakes can be kept for up to a week – in an air-tight container in the fridge. Let the cupcakes sit at room temperature for 15 minutes before serving. 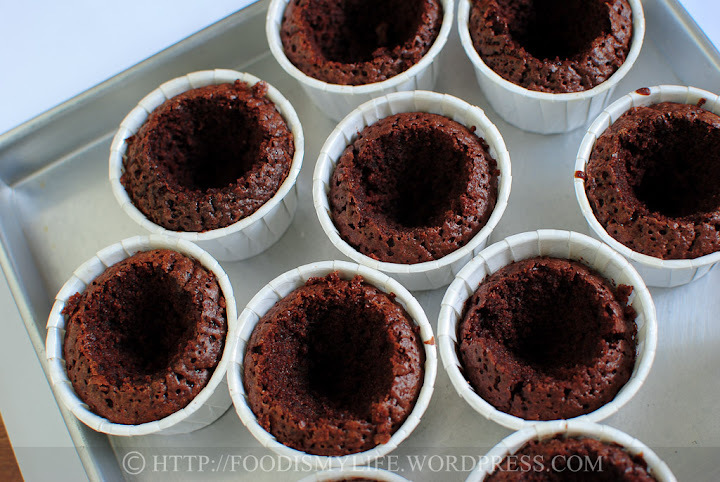 The cupcakes will still be slightly chilled but the ganache has softened – perfect for me! 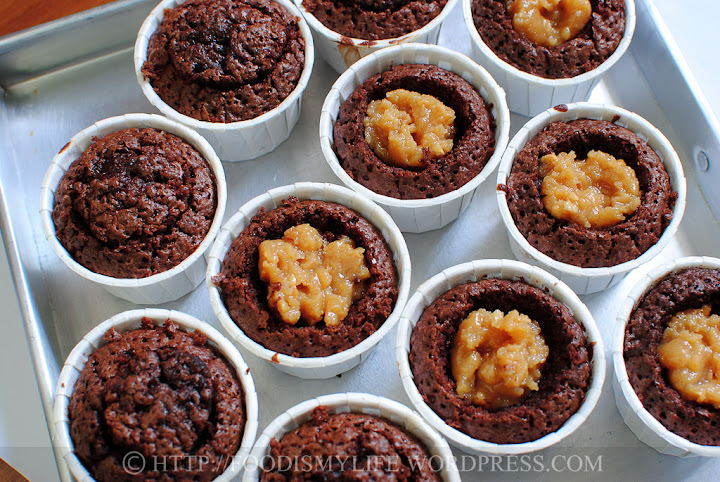 From cupcakeblog’s photos on this recipe, the ganache is soft but still stiff enough to be piped onto the cupcakes. Mine, however, was too runny, so I could only spread it on top with a spatula – I don’t know where went wrong! 🙁 I’ll try using the Swiss Italian meringue buttercream from my log cake recipe the next time I bake these cupcakes. Yes I did 🙂 Have a great week ahead too! i’m actually impressed by the way you cut the cone out from the cupcakes. Dont worry about not visiting, you hv a good rest, happy baking! Thank you! 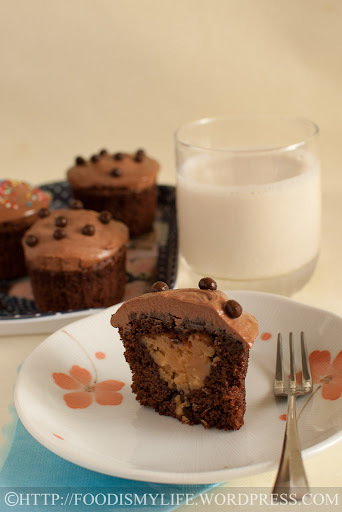 Chocolate and peanut butter are perfect for each other! Thank you! Yes, peanut butter and chocolate just can’t go wrong! Awww thanks! I hope the post made your day (: Hope you can make these cupcakes and surprise your loved ones one day! These are really great cupcakes! Thanks for the idea! Fantastic idea!! Peanut butter and chocolate are one of my favourites! om nom nom! There’s definitely a lot of steps for one cupcake! But these look incredibly good! Yum! My favorite chocolate and combined with peanut butter soooo… delicious. Beautiful cupcakes, great recipe!